Jeffery Smith scientific investigator, author and champion of nonGMOs spoke yesterday at the Encinitas Community Center. His ongoing extensive scientific investigations are quite revealing about GMOs. One genetically modified corn strain has a Bt toxin which produces a pesticide. It remains and reproduces in your gut! When prompted he told us of scientific suppression by research institutions and scientists who are denied access to the GMO seeds and denied funding and ostracized for coming out and reporting the truth. He told of the faulty science put out by the biotech industry that has their misinformation down to a science, using highly outdated methods to show inconclusive results. What happened in EUROPEAN Markets when consumers demanded to know about GMOs? European branches of Nestle, Coca-cola, Hersheys switched to non GMO ingredients to meet the demand. Imagine an ORGANIC nonGMO Happy Meal, if the money goes that way…corporations will follow the money. It’s not far off, we must grow this right to know, shift the market a bit. Don’t stop saving seeds and planting gardens, buying local, but remember we are part of larger spheres of influence. There are no closed systems or trash on this earth. The most altering game humans have engaged in yet is this change of the codes of life, GMOs. The DNA is an up regulator, antenna for light and sound particles. If we mess with those codes we will become even more abstracted from life as it is natural. Lead with love and not fear. Come out and celebrate on Saturday. Bring your drums…it’s just the beginning and at least have fun. 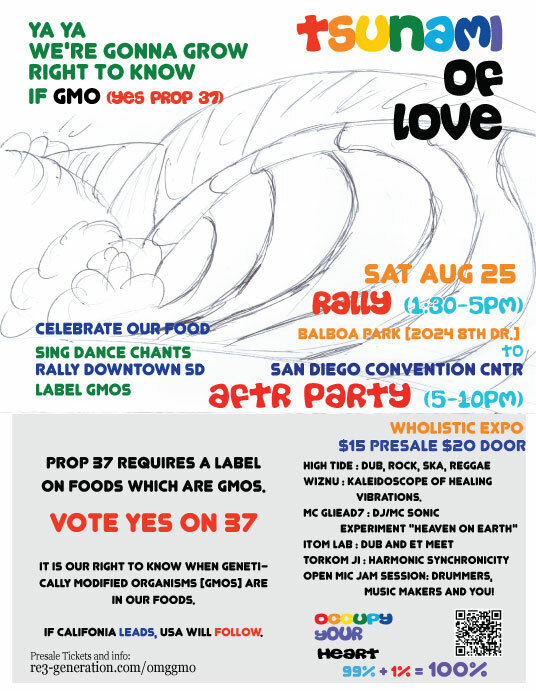 Jeffrey Smith will be speaking out in San Diego all this week and feature in a programing at the Wholistic Expo geared toward Prop 37 – Labeling GMOs.